Take another look, we don't have a two-fer this month. Those are one 1965 Dodge Coronet AFX Altered Wheelbase Dodge model you see above. Ron Dreschler modeled two of the most exciting harbingers of the Funny Car era in this one car. 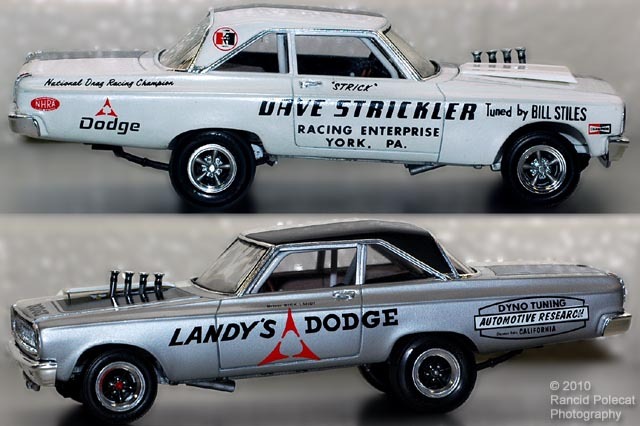 For the 1965 drag racing season Chrysler produced six of these altered wheel base Dodge Coronets (along with six Plymouth Belvederes) that had the centerlines of the front and rear wheels were moved forward under the bodies and the wheelbase shortened by more than 5 percent. This placed maximum weight on the back axles and better used weight transfer to optimize off the line traction.